One of our generation’s most influential creatives, Stan Lee, has died aged 95. His creations, ranging from Spider-Man to the X-Men, breathed life into the superhero genre. At the time superheroes were typically otherworldly, perfect and unrelatable, but Stan brought them a little more down to earth. For example, Peter Parker, aka Spider-Man, was far more concerned with taking care of his frail aunt, talking nervously to girls and paying rent than he was with supernatural crime-fighting. Lee also set his fantasises in real world locations such as NYC, rather than the fictional Gotham for example; and it is this everyday touch that made his characters so relatable, relevant and inspiring. As a design agency we are constantly promoting the relevance and impact of good product design. Great design extends far beyond form or function, into a more emotive space. Early in his career, Stan Lee questioned the meaningfulness of his work, telling the Chicago Tribune “I used to think what I did was not very important. People are building bridges and engaging in medical research, and here I was doing stories about fictional people who do extraordinary, crazy things and wear costumes. But I suppose I have come to realise that entertainment is not easily dismissed." Although we at Designworks do a lot of incredibly worthwhile work within medical and engineering sectors, Stan Lee demonstrated that great design at a purely superficial level can have far reaching and incredibly positive impacts. He pushed and proved the relevance of fun, fiction and fantasy. Thanks to Stan’s work, we treat our work within the toy sector with just as much importance as any high-tech medical project. Although he has sadly passed away, Stan’s legacy will outlive him a thousand times. It is hard to think of anyone who his stories have not touched. At Designworks we have Stan to thank for a whole lot. Firstly, for inspiring many of our employees! The incredibly rich marvel universe has fascinated our sculptors, designers and model makers alike. Whilst our staff debate about generational differences in music, fashion and design influence; we can all agree that we wish we were in the avengers! Secondly, many projects within our sculpting department, now sub-branded sculptworks, have been for Marvel licenses. 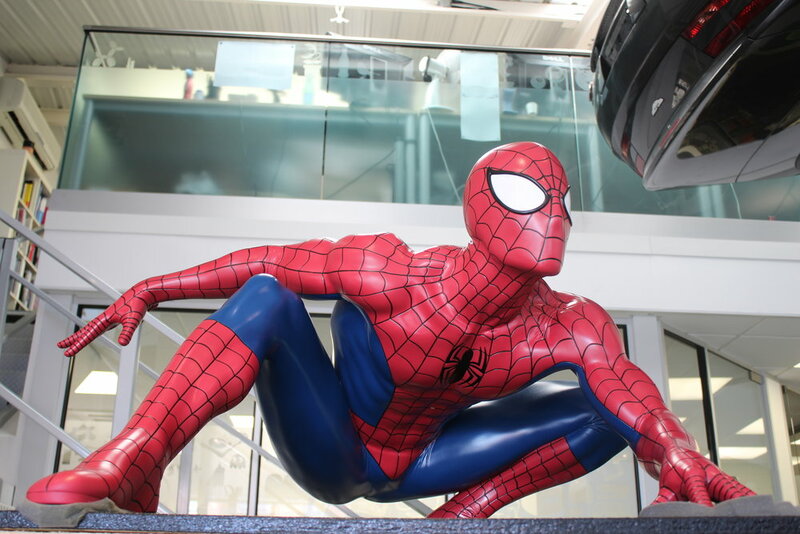 We have sculpted an entire Marvel chess set featuring Spidey, Wolverine and The Hulk, we’ve designed Spider-Man Weeble toys, and even a life-size fibreglass Spider-Man for Madame-Tussauds! We’re incredibly sad to hear about Stan Lee’s passing and our condolences go out to all those who were lucky enough to know him personally. We hope to be reading, watching and working on his characters for years to come.